Cleaning Baby’s Teeth – Are You Doing It The Right Way? Cleaning your baby’s teeth, are you doing it the right way? So you’re all happy and excited to see your baby’s teeth starting to come in. But, are you doing enough to offer complete oral care for making sure that your child’s adult teeth come in healthy too? What most parents don’t realize is that baby teeth are more likely to develop decay as well as cavities because of the unavoidable use of milk bottles and juices. The good news is parents can provide maximum protection to their baby’s teeth by taking the right steps of cleaning and looking after their baby’s teeth. 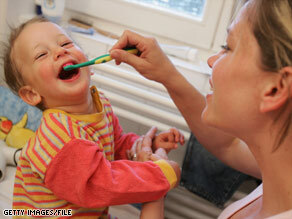 The first step is to realize the importance of introducing the use of toothbrush to your child at an earlier stage. There are infant toothbrushes available in the market today that are small as well as soft, which will help your baby get used to regular brushing. When you’re brushing your baby’s teeth, make sure that you do it gently on every surface at least two times a day. It isn’t necessary to use toothpaste for brushing unless your child turns two years of age, but you may use baking soda in combination with water for cleaning the teeth. Warm water can be used too until your baby has started having table food or developed more teeth. Or if you want to use a wet cloth for wiping the teeth, go ahead. Always look for possible signs of cavities or dental problems. The signs of cavity in baby teeth are discolored teeth or slight pitting in teeth. If the baby isn’t put to bed with milk bottles in mouth, cavities can be avoided. Lastly, it is important to make sure that you schedule an appointment for your baby with your dentist at Brighton Implant Clinic. Making children visit the dentist between the ages of six and twelve months plays an important role in ensuring maximum preventative care.